Make copies of all of your credit cards, important identification information, including your medical insurance cards, and your traveler's checks. Take one copy with you (pack it separately from the cards themselves) and leave one copy at home. Take only a little cash with you. Bring most of your money in the form of traveler's checks or plan to use your credit cards while on vacation. Make sure all of the doors and windows to your home are secured and locked. If your home has an alarm system, arm it when you leave for your vacation. Never post your travel plans on social networks such as Facebook, MySpace or Twitter. Have your mail held at the post office and your newspaper delivery put on hold or ask a family member, a trusted friend or neighbor to pick those items up for you. Park your car in areas that are well lit and as close to your destination as possible. Always close all of the windows and lock the car doors. Keep all valuables out of view by locking them in the trunk, tucking them under the seat or placing on the floor and covering them with a blanket. Never leave your wallet, pocketbook or checkbook in the car. Always keep them with you. If you are driving and become lost, do not stop on the side of the road to check the map. Drive to a brightly lit, public place to do so. Never leave your car unattended with the motor running. If you are going out sightseeing, ask at the hotel front desk if there are any areas you should avoid. Only take the cash you need for the day with you. Leave the rest, and all other valuables, locked in the hotel or motel safe. Never display large amounts of cash when making a purchase. The money you keep with you should be in small denominations. When you check into your room, make a mental note of the locations of the stairs and fire exits. Whether you are traveling to a tropical beach or a snow-covered mountain, there are things you can do to keep your skin and eyes safe from the dangers of the sun. Use a broad spectrum sunscreen that protects against both UV-A and UV-B radiation from the sun. It should have an SPF rating of 15 or higher. Apply the sunscreen 15-30 minutes before going out in the sun and reapply it often. Always reapply the sunscreen after swimming or any physical activity. According to the American Optometric Association you should wear sunglasses whenever you are outside in the sun. The minimum requirements for proper protection for your eyes are sunglasses that screen out 75 to 90 percent of visible light and block at least 99 percent of UV-A and UV-B radiation from the sun’s rays. If you are taking any medications, check with your doctor or pharmacist to make sure that they do not cause photosensitivity, which makes you more susceptible to skin damage from the ultraviolet light of the sun. Only swim at beaches that are supervised by lifeguards. 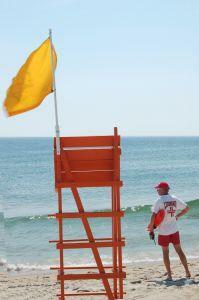 Even if there are life guards on duty, never leave a child unattended at a beach or pool. If you are swimming in the ocean and are caught in a rip tide or a current, call for help and swim diagonally across it or with it until you get free. Never try to get free of the current by swimming against it. Whenever you are on a boat wear a life jacket that is Coast Guard approved. If you have been drinking any alcoholic beverages, stay out of the water. Do not operate a boat, jet ski or any other type of water craft. By following summer vacation safety tips and procedures, you reduce the chances of having your good times spoiled. Knowing you are doing everything you need to do to ensure your safety and the safety of your loved ones gives you peace of mind as you relax and have fun.